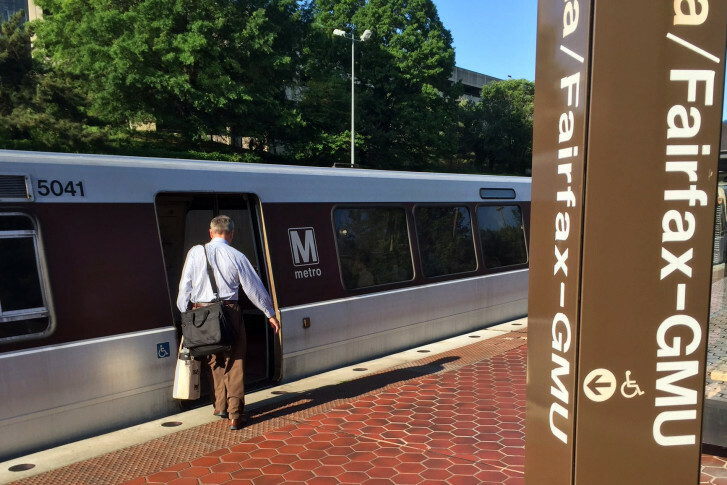 STERLING, Va. — The leaders of Northern Virginia’s five most populous jurisdictions pledged Wednesday to push back on the General Assembly’s move this year to pull money from regional transportation projects to provide dedicated funding for the Metro system. Fairfax County Board Chairman Sharon Bulova, Alexandria Mayor Allison Silberberg, Arlington County Board Chair Katie Cristol, Loudoun County Board Chair Phyllis Randall and Prince William County Board Chair Corey Stewart all agreed on the need for changes to this year’s landmark dedicated funding bill as they spoke together Wednesday to Northern Virginia business and other leaders at the Loudoun Campus of Northern Virginia Community College. Virginia Railway Express also got a smaller amount of dedicated funding in the bill to put toward large capital projects. Gov. Ralph Northam has promised to look at fixes for the funding issues raised by local governments and business groups in Northern Virginia. While the version of the bill backed by Northam that passed the Senate would have raised real estate and hotel taxes to provide additional transportation funding, the bill eventually approved by the General Assembly instead shifted existing Northern Virginia money around. Republicans hold a 51-49 majority in the House of Delegates, and used the majority to block that plan. Del. Tim Hugo, the lone Republican left in the delegation representing jurisdictions served by Metro, led the charge. In an interview Wednesday, he said there is still no reason to support new taxes to fund transportation needs since even with the cuts, there is still $1 billion available over the next six years. “We can work on getting more money for roads, and we should — and more money for transportation in general — but I think what they’re advocating is a tax increase. And I don’t think a tax increase is necessary and I don’t think a tax increase is what the people of Northern Virginia want,” Hugo said. The General Assembly, including Republicans, did vote to set a minimum level on the regional gas tax in Northern Virginia and Hampton Roads, raising the tax to match the intent of the 2013 law that created it. Cristol blamed the votes earlier this year on simple partisan divides. “Unfortunately, ideology prevailed in the General Assembly. I think there’s no other way to put it. But we are absolutely committed to continuing to fight,” she said. She acknowledged it is an uphill climb to getting any additional statewide funding for Northern Virginia. Northam has suggested there could also be other ways to provide state funding, such as through the state budget. “I look forward to hearing them advocate for a big tax increase next year,” Hugo said. Stewart, the Prince William County Board of Supervisors chairman and lone Republican among the local elected leaders on stage Wednesday morning, said there is a need for more regional funding though. Echoing Democrats and others who supported the Metro funding bill originally passed by the state Senate this winter, Stewart warned that Northern Virginia will now be competing with other parts of the state for even more statewide road construction dollars. Randall, the Loudoun County Board of Supervisors chair, pointed to years of patience after a 2013 transportation funding bill was snatched away — just months before a final vote was set on a six-year spending plan for regional projects meant to reduce congestion. The vote moved forward, but with several projects bumped off that list or separate local funding plans. “If Metro moves Northern Virginia, and Northern Virginia’s resources are important to the Commonwealth of Virginia, then the Commonwealth of Virginia should put in a higher amount of money into Metro, as should the federal government,” Randall said. “Yes, the energy up here to push back and to readdress the transportation bill is going to be robust,” she added. Silberberg, the Alexandria mayor set to leave office in January, said dedicated funding should have been in place from the time Metro opened more than 40 years ago. “We’re putting Humpty Dumpty back together again for the right reasons, but we’ve got to fix this here in Virginia because NVTA does need that money,” she said.